To make the jam, combine the mashed bananas and lemon juice in a large pan. Next stir in the sugars, butter, and cinnamon. Place the pan over low heat, stirring continuously until the sugars have melted completely. Increase heat, bring to a full rolling boil. Stir continuously until the jam thickens to a spreading consistency. Turn off heat. Cool completely, pour into a jar, and refrigerate. This jam will stay well in the refrigerator for up to a month. It taste great on hot toast. Warm it up as needed to enjoy over vanilla ice cream. To make the Bananas Foster cake: combine the all purpose flour, baking powder, baking soda, and salt in a large mixing bowl. To this mix, add the sour cream, olive oil, and the bananas foster jam. Stir well to combine all ingredients into a thick batter. Pour this batter into a prepared baking pan and bake in a preheated oven at 350 F for 35-40 minutes. Remove from the oven. Cool in the pan. Remove, slice and enjoy. This is one of the best banana bread recipes if you like to slice and toast your bread. 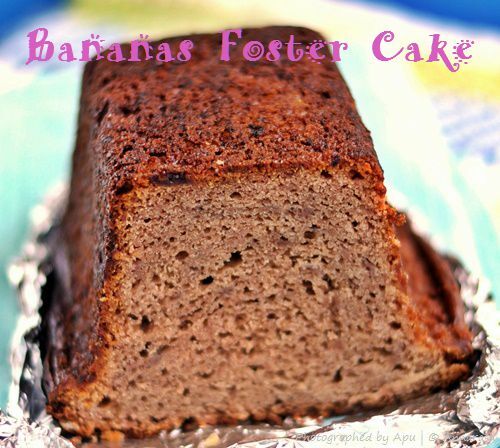 It taste great with butter or Nutella if you like a chocolate flavor with bananas. wow thats a alluring cake , looks so addictive .. I would love to grab a piece right away !! Delicious cake and beautiful clicks!